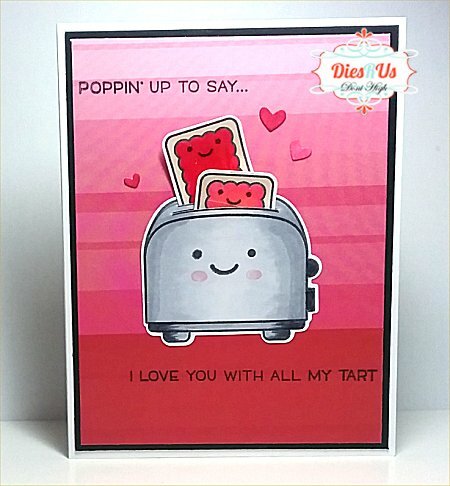 Doni here today with a cute Valentine card to share with you. I used the Lawn Fawn stamp called Let's Toast to make this very quick and easy card. Don't you just love those sweet little smiley faces?! and then matting it on black card stock showing a 1/8 " border all around. Next the fun part.....stamp and color the toaster and the two tarts.I used my Copic markers. Then I used the coordinating dies to cut them out. I love the way the die cuts the slots on top of the toaster! finishing by adding a few tiny hearts. What did I tell you...so easy! Love the sentiment. Great card! What a cue card! Love the puns!